1. 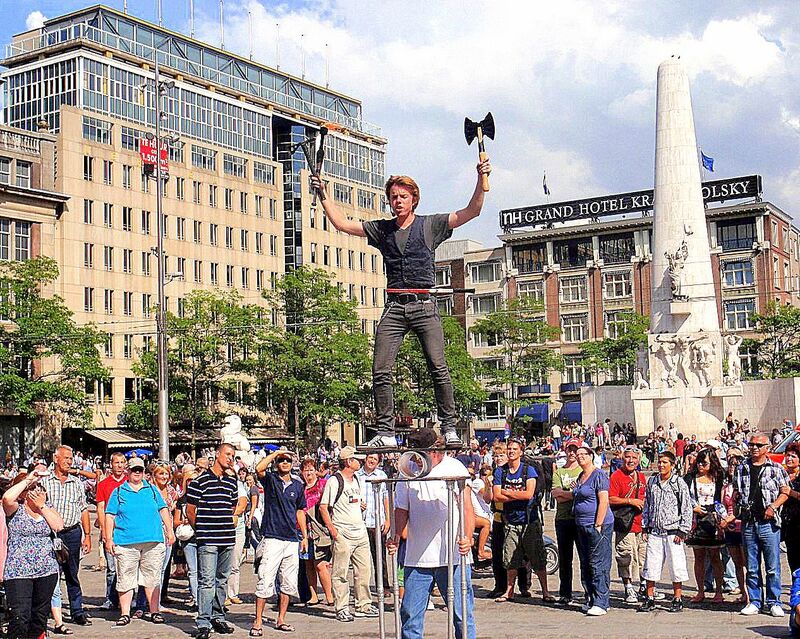 Street Entertainment: If you hang around Dam Square, Leidseplein or Rembrandtplein long enough, you’re bound to come across talented musicians, jugglers, mimes, break dancers and comedians who come from around the globe to perform in public squares for free. Many are aspiring stars and this is their livelihood, so be sure to throw a few euros their way if they’ve inspired a belly laugh. 2. Rijksmuseum Gardens: There’s a fee to enter Amsterdam’s renowned Rijksmuseum, but access to its Baroque and Renaissance Gardens is FREE. Pick up a gratis guide to five centuries of salvaged Dutch architectural pieces, including magnificent Gothic pillars and 17th century city gates set amidst fountains and ponds. Renovated as part of the 10-year overhaul of the museum, the new outdoor gallery includes many original sculptures, ponds and lawns. New elements include post-war playground equipment, a 19th century greenhouse with heirloom vegetables, and a water maze based on a design by Danish sculptor Jeppe Hein. It’s free to smell the roses at Amsterdam’s floating Bloemenmarkt. 3. Bloemenmarkt: Amsterdam’s floating flower market is a fine source for high-quality flora. Pick up a bag of tulip bulbs for the folks back home and they’ll thank you when they receive the gift, then think of you again in spring when the blooms come up. The thoughtful souvenir will cost you a few euros, but it’s free to smell the roses and photograph the stunning blooms at this fragrant open flower market lining Singel Canal between Muntplein and Koningsplein. 4. Gassan Diamond Factory Tour: Want to give your sweetheart a hint or nudge your relationship to the next level? In what’s been called the City of Diamonds for 425 years, visit a diamond cutting company based in a historic factory once powered by steam. At Gassan Diamonds, free daily tours (offered in more than 27 languages) look behind the scenes peek at a gem factory in action. Learn how diamond cutting evolved and how a stunning gem emerges from rough stone. Find out about carats, colors, clarity and cuts, including the coveted Amsterdam cut. The tour and bling banter are free, as is the chance to ogle at Gassan’s proprietary cut, the Gassan 121, boasting 121 facets. But bring a wallet filled with plastic or euros to purchase any of the sparkly gems or glitzy watches in The Boutique, adjacent to the factory. Have your stone set in the design of your choice or choose from pieces by leading brands, including Omega, Longines, Tissot and Swatch. 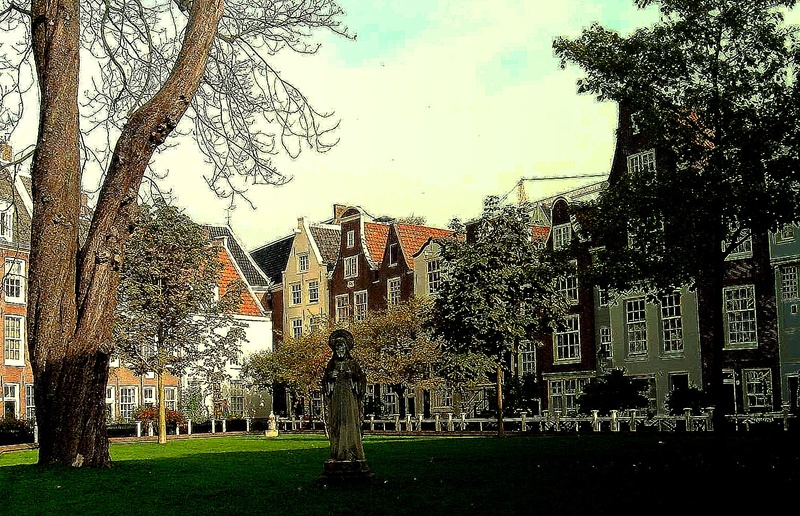 Find respite from city buzz at the Begijnhof, still a place of worship in Amsterdam. 5. The Begijnhof: After the glitz of the previous excursion, find respite in this hidden courtyard protected from the madness of central Amsterdam. Beyond the Begijnhof’s humble doors, an oasis of 14th century houses, gardens and relic-filled churches provides quiet escape from the buzz of the city. Once a residential sanctuary for the Bengijntjes, a Catholic sisterhood comprised of women who took no monastic vows but dedicated their lives to educating the poor and taking care of the sick, it’s now a place where people still gather to worship, marry and reflect. 6. Hollandsche Manege: Who would guess a national riding school would be housed in a neoclassical structure in Amsterdam’s Museum District? Even if you’re not an equestrian, a visit to Hollandsche Manege is worthwhile just to admire the ornate architecture and watch the regal trotting from the elegant café. Inspired by Vienna’s Spanish Riding School, the Netherlands Horse School has been open since 1882. 7. Amsterdam Architecture Foundation: Amsterdam’s mix of eclectic architectural styles is no accident. Since 1986, it’s been overseen by the Amsterdam Architecture Foundation (ARCAM), founded to shape the future of urban design in Holland. At no cost, browse exhibits of uber-cool contemporary design or chat with staff about digital guides to architecture along city tram routes and other free resources. In addition to raising awareness about urban design, ARCAM works with rising stars in the architectural field, as well as institutions influencing city architecture. Five annual exhibitions present new developments alongside a historical perspective of urban design in Amsterdam. Set in a funky, transparent aluminum structure, fronting the NEMO Museum near Central Station, ARCAM will inspire anyone interested in urban design. Looking for free WiFi or an English-language newspaper? Visit the library! 8. Openbare Bibliotheek Amsterdam (OBA/Amsterdam Public Library): If you think all libraries are created equal, visit this sunlit temple of print and electronic media to change your mind. 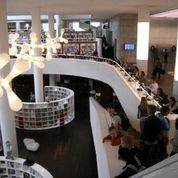 Since opening in 2007 on the Oosterdokseiland, a five minute walk heading east from Central Station, Europe’s largest public library has drawn some 2.5 million visitors annually. Alongside books and multimedia, the seven-story structure overlooking the Ij River houses a 250-seat theater, radio station, meeting rooms, exhibition space, music department, study pods and readers’ café. A restaurant with an outdoor terrace provides panoramic views of the city. Visitors are welcome to use any of 600 Internet-connected computers, 50 multimedia workstations, 110 reference terminals and 11 print stations. You can also browse newspapers and magazines from around the world at no charge. If you’re lucky, someone will be showcasing some talent on the lobby piano or a special exhibit, film showing, reading, concert, lecture or workshop may be scheduled. Need to e-mail Mom, book a hostel or check Facebook? It’s possible seven days a week in Amsterdam’s Most Sustainable Public Building—its public library. The EYE-bar restaurant tops the striking EYE Film Institute on the bank of the River Ij. 9. EYE Film Institute: Once headquartered in Vondelpark, the new center for this homage to international cinema perches like an ivory spaceship ready for launch on the northern bank of the Ij River. Its art-house movies and main-floor exhibitions have entry fees, but the interactive film displays in the basement are FREE. The striking facility houses four movie screening rooms, a museum shop and exhibit space. To reach it, take the free Buiksloterweg ferry behind Central Station. Before leaving, refuel with a plate of bitterballen and beer on tap, served in the eye-popping EYE Bar restaurant. 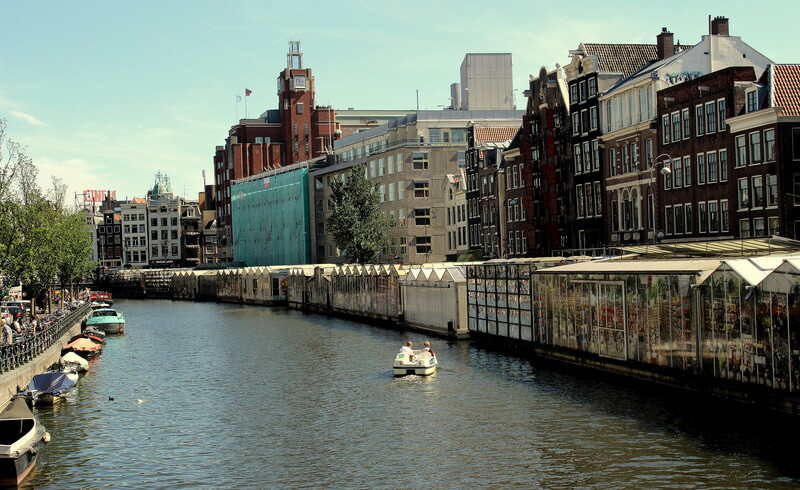 Learn more in my AFAR Guide to Amsterdam. 10. Cannabis College: You can get your Cannabis College diploma online, but pay a visit to this nonprofit center to get all your questions about the world’s favorite herb answered by informed volunteers. Since 1998, Cannabis College in Amsterdam’s Red Light District has been dispensing honest, unbiased advice about safe, recreational marijuana use. Free guided tours provide background about the history of cannabis use, marijuana cultivation and stages of growth, drug paraphernalia, coffeeshop etiquette and myriad nutritional and industrial hemp applications. The center’s pride and joy is its basement garden, where five enormous organic cannabis plants thrive. No touching or sampling allowed, but photos are encouraged. Have you found other FREE things to do in Amsterdam? Join the fun and share the wealth in the comments below! Previous It’s Tulip Time in Holland! I love this blog. These are so detailed useful informations which make a stay in Amsterdam much more interesting. This is terrific! I am leaving for Amsterdam this Friday, and can’t wait to explore your suggestions. I especially jazzed for the floating flower market. I hope I can meet you there, as well! I love this! Your blog is super helpful and fun! My friends and I will be in Amsterdam in a couple weeks and this will definitely come in handy. We are college kids which means that we love free things!! Haha thank you! Thank you so much for this valuable information! It’s very detailed and interesting! It’s always nice to have free things to do! Hugs! The library is one of the coolest buildings in A’dam. Don’t miss the view from the top! What a wonderful blog! Great ideas that I would have never thought of doing before. Perfect for my upcoming trip to Amsterdam since I will have a tight budget. Thanks for the great tips, looking forward to explore Amsterdam! Awesome post! Definitely helpful for a budget backpacker like myself. This is such a wonderful thing for a beginner of Amsterdam and I will be sure and send ideas your where to help grow it…. The most beautiful things in life are FREE! I can add – not only in life, but in human relations and in travelling! Сost of many things sometimes overrated (advertising really helps)) And if you’re not a millionaire, but only a student – is very important to listen to the advice of the wise people who can always advise something more economical, but no less interesting! What great ideas for travelers on a budget! Thank you so much for posting this and the FREE Things: Part 1 article–they’re extremely helpful! My friend and I just graduated college and are traveling Europe on a post-grad budget, and we’re really looking forward to coming to Amsterdam now that we have all these things to do and see! I appreciate you suggesting many off-the-beaten-path sites, too–that’s what traveling is all about! Can’t wait to visit! 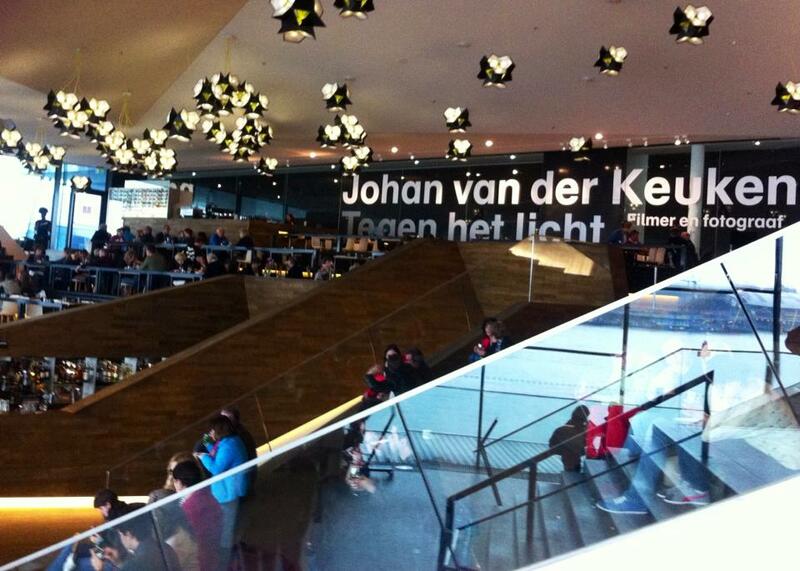 Amsterdam’s public library is a gorgeous place, with a piano + great view from the top. Also, Internet stations, but I think they charge now ;-(. Melissa, Thank you so much for this blog! It is very helpful to have a point of view of the city from someone who used to live in the U.S. I can’t wait to visit Amsterdam and see the beauty it has to offer. I’m especially interested in the public library as well as Begijnhof. Thanks again for sharing! Our public library is gorgeous…complete with a lobby piano + killer view. See you soon! Wow, what a beautiful city! We can’t wait to experience these suggestions when we visit Amsterdam. Sounds like there’s something for everyone. We’re particularly excited about the Rijksmuseum gardens, and the floating flower market! You certainly saved the best for last ;), but I’m starting to think that I’m going to have to allot more time from my trip to Amsterdam, especially to take in the old and new architecture. I have looked up free things to do in Amsterdam and I definitely didn’t find these! Great suggestions. I am also think I will take your suggestion about getting tulip bulbs as a gift. Wonderful idea. So many things to do, thanks a lot for all of these suggestions. I am sure we’ll have a great time there. I just hope we’ll have enough time! You got it. Witte Perle @ Sound Garden. Weather looks good…I’ll find a table!